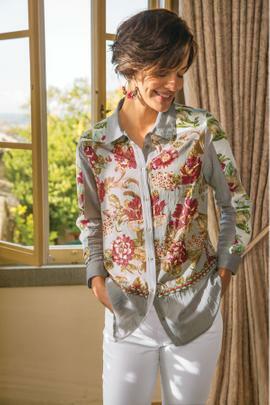 For many women, shirts and blouses are an everyday staple. That’s why we’ve curated a collection of women’s shirts for every occasion. This assortment includes wonderful tops for wearing at home, while you are out and about, or for a special evening.For those times when you want to look your best, our linen shirts are an elegant choice. Crisp and comfortable, they pair wonderfully with slacks and skirts, but can also go great with denim. Of course, our shirts are available in other fabrics as well, including cotton, Tencel®, silk, and velvet. Many feature unique embellishments, including embroidery or decorative buttons, making each of these pieces as distinctive as you are.Because we know how important comfort is to you, we’ve given all of our shirts a softness rating. As you browse the collection, check these ratings so you’ll be able to choose the shirt that is just right for you.